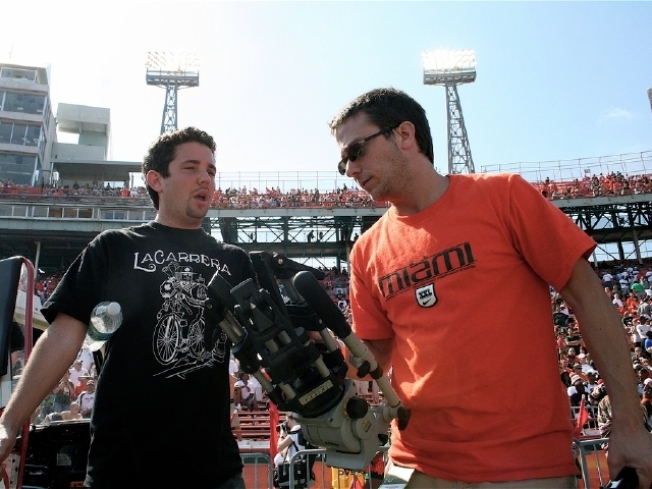 Alfred Spellman and Billy Corben of "The U." ORANGE ON ONE SIDE: In case you missed the screening of University of Miami football documentary "The U" at the Cosford Cinema, and on ESPN, you've got yet another chance tonight at Miami City Hall. Plus, not only will you get an extra 15 minutes, as it's the extended cut, but it's also free. 6:30-8:30 P.M.
JAZZ HANDS: The extent of your cultural immersion on a Wednesday night usually consists of watching "It's Always Sunny in Philadelphia" on Netflix. Do something you can actually brag about the next day around the water cooler by seeing - and, more importantly, hearing - jazz performer Ottmar Leibert his band, Luna Negra at the Gusman Center. 8 P.M. SING IN THE NEW YEAR: And speaking of culture, you won't find any tonight at Transit Lounge, as its Karaoke Wednesday. But you will find lots of people three sheets to the wind singing Journey. Or any number of other songs that should never be sung in public. 10 P.M.